Childhood blindness is an important cause contributing to the burden of blindness. Blindness in children can be defined as a visual acuity of <3/60 in the eye with better vision of a child under 16 years of age. This generally means that the child cannot see something three feet (about one meter) away, that another child could see if it was 60 feet (about 20 meters) away. There are many causes of blindness in children. Blindness may be due to genetic mutations, birth defects, premature birth, nutritional deficiencies, infections, injuries, and other causes. Severe retinopathy of prematurity (ROP), cataracts and refractive error are also causes. Childhood blindness has many causes, and each cause has its own method of damaging the eyes. Leber congenital amaurosis primarily affects the retina, typically severe visual impairment begins in infancy. Mutations in Aryl hydrocarbon receptor interacting protein like-1 have been linked to Leber congenital amaurosis (LCA). The diagnosis of childhood blindness is done via methods to ascertain the degree of visual impairment in the affected child doing so via dilating eye drops and the proceeding eye exam. Whether blindness is treatable depends upon the cause. Surgical intervention can be performed in PCG which is childhood glaucoma, usually starting early in childhood. Primary congenital glaucoma is caused by an abnormal drainage of the eye. However, surgical intervention is yet to prove effective. Braille is a universal way to learn how to read and write, for the blind. A refreshable braille display is an assistive learning device that can help such children in school. Schools for the blind are a form of management, however the limitations of using studies done in such schools has been recognized. Children that are enrolled presently, usually, had developed blindness 5 or more years prior to enrollment, consequently not reflecting current possible causes. About 66% of children with visual impairment also have one other disability (comorbidity), be it, intellectual disabilities, cerebral palsy, or hearing loss. Eye care/screening for children within primary health care is important as catching ocular disease issues can lead to better outcomes. The number of children who suffer from blindness worldwide is approximately 1.4 million. 75% of the world’s blind children live in Africa and Asia. A 2014 review indicated that an estimated of 238,500 children with bilateral blindness (rate 1.2/1,000) in the Eastern Mediterranean region. VISION 2020 is a program launched by the International Agency for the Prevention of Blindness (IAPB) and is supported by the WHO in 1999 that has made controlling blindness in children a high priority. ^ "Eye Problems in Babies. Baby Eye Problems. Patient". patient.info. Retrieved 2 January 2018. ^ Gogate, Parikshit; Gilbert, Clare; Zin, Andrea (2011). "Severe Visual Impairment and Blindness in Infants: Causes and Opportunities for Control". Middle East African Journal of Ophthalmology. 18 (2): 109–114. doi:10.4103/0974-9233.80698. ISSN 0974-9233. PMC 3119278. PMID 21731320. ^ a b "Guidelines for Use of Vitamin A Supplements" (PDF). Vitamin Angels. Archived from the original (PDF) on 20 October 2014. Retrieved 13 October 2014. ^ Mabey, David; Gill, Geoffrey; Weber, Martin W.; Whitty, Christopher J. M. (2013-01-17). Principles of Medicine in Africa. Cambridge University Press. ISBN 9781107002517. ^ "Visual impairment - NHS Choices". www.nhs.uk. Retrieved 2015-07-17. ^ Gilbert, Clare; Muhit, Mohammed (2008). "Twenty years of childhood blindness: what have we learnt?". Community Eye Health. 21 (67): 46–47. ISSN 0953-6833. PMC 2580065. PMID 19030129. 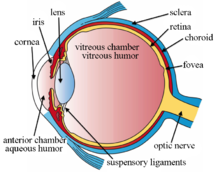 ^ International Committee for the Classification of Retinopathy of Prematurity (July 1, 2005). "THe international classification of retinopathy of prematurity revisited". Archives of Ophthalmology. 123 (7): 991–999. doi:10.1001/archopht.123.7.991. ISSN 0003-9950. PMID 16009843. ^ Bhattacharjee, H; Das, K; Borah, RR; Guha, K; Gogate, P; Purukayastha, S; Gilbert, C (Nov–Dec 2008). "Causes of childhood blindness in the northeastern states of India". Indian Journal of Ophthalmology. 56 (6): 495–9. doi:10.4103/0301-4738.43368. PMC 2612985. PMID 18974521. ^ Ezegwui, IR; Umeh, RE; Ezepue, UF (Jan 2003). "Causes of childhood blindness: results from schools for the blind in south eastern Nigeria". The British Journal of Ophthalmology. 87 (1): 20–3. doi:10.1136/bjo.87.1.20. PMC 1771452. PMID 12488255. ^ Hartnett, Mary Elizabeth (2005-01-01). Pediatric Retina. Lippincott Williams & Wilkins. ISBN 9780781747820. ^ "NCBI - WWW Error Blocked Diagnostic". www.ncbi.nlm.nih.gov. Retrieved 2015-07-15. ^ "Vitamin A — Health Professional Fact Sheet". ods.od.nih.gov. Retrieved 2015-07-17. ^ Bello, Segun; Meremikwu, Martin M; Ejemot-Nwadiaro, Regina I; Oduwole, Olabisi (2014). "Routine vitamin A supplementation for the prevention of blindness due to measles infection in children". Reviews (1): CD007719. doi:10.1002/14651858.CD007719.pub3. PMID 24436005. ^ Mirdehghan, S. A.; Dehghan, M. H.; Mohammadpour, M.; Heidari, K.; Khosravi, M. (2005-05-01). "Causes of severe visual impairment and blindness in schools for visually handicapped children in Iran". British Journal of Ophthalmology. 89 (5): 612–614. doi:10.1136/bjo.2004.050799. ISSN 1468-2079. PMC 1772642. PMID 15834095. ^ Ghate, Deepta; Wang, Xue (2015). "Surgical interventions for primary congenital glaucoma". The Cochrane Database of Systematic Reviews. 1: CD008213. doi:10.1002/14651858.CD008213.pub2. ISSN 1469-493X. PMC 4438567. PMID 25636153. ^ Roth, Ginny A.; Fee, Elizabeth (2011-03-01). "The Invention of Braille". American Journal of Public Health. 101 (3): 454. doi:10.2105/AJPH.2010.200865. ISSN 0090-0036. PMC 3036681. PMID 21307377. ^ MD, Elias I. Traboulsi (2011-12-01). Genetic Diseases of the Eye, Second Edition. Oxford University Press, USA. ISBN 9780199716975. ^ Gogate, Parikshit; Kalua, Khumbo; Courtright, Paul (2009-12-08). "Blindness in Childhood in Developing Countries: Time for a Reassessment?". PLoS Med. 6 (12): e1000177. doi:10.1371/journal.pmed.1000177. PMC 2779494. PMID 19997501. ^ "Vision Loss | Kids' Quest | NCBDDD | CDC". www.cdc.gov. 2015-02-07. Retrieved 2015-07-17. ^ a b Khandekar, Rajiv; Kishore, H.; Mansu, Rabiu M.; Awan, Haroon (2014). "The Status of Childhood Blindness and Functional Low Vision in the Eastern Mediterranean Region in 2012". Middle East African Journal of Ophthalmology. 21 (4): 336–43. doi:10.4103/0974-9233.142273. ISSN 0974-9233. PMC 4219227. PMID 25371641. ^ "WHO | Priority eye diseases". www.who.int. Retrieved 2015-07-17. ^ "VISION 2020". IAPB. Retrieved 12 October 2014. Hidalgo-de-Quintana, Juan; Schwarz, Nele; Meschede, Ingrid P.; Stern-Schneider, Gabriele; Powner, Michael B.; Morrison, Ewan E.; Futter, Clare E.; Wolfrum, Uwe; Cheetham, Michael E. (March 23, 2015). "The Leber Congenital Amaurosis Protein AIPL1 and EB Proteins Co-Localize at the Photoreceptor Cilium". PLoS ONE. 10 (3): e0121440. Bibcode:2015PLoSO..1021440H. doi:10.1371/journal.pone.0121440. PMC 4370678. PMID 25799540. Rahi, J. S. (2007-01-01). "Childhood blindness: a UK epidemiological perspective". Eye. 21 (10): 1249–1253. doi:10.1038/sj.eye.6702837. ISSN 0950-222X. PMID 17914426. This page was last edited on 7 March 2019, at 06:23 (UTC).